I’m crazy for signs! One of the very first things I worked on when I started at the Museum 19 years ago was to help redo the Great Western Sugar Company exhibit. It was our goal to make the exhibit have the feel of an actual factory through the use of sound and texture. What better way to lend to the ambiance than through the use of signs! 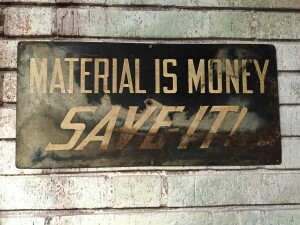 There were many to choose from in the collection, mostly providing warning about the hazards of the workplace, but my favorite is the one stating Material is Money Save It! Not just for the message, which I think is a good one, but also because of the beautiful way it has aged over time in the factory environment. 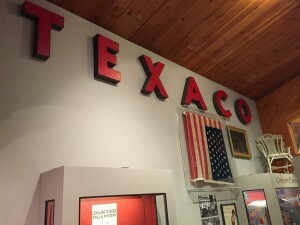 The Mike’s Texaco sign was the next sign that I fell in love with and hangs in the Fireside Gallery. Mike’s Texaco was located across the street from the Museum, and we salvaged the sign in 1997 when the gas station was torn down. The lot across the street remained empty for what seemed like years until Lincoln Place was built. 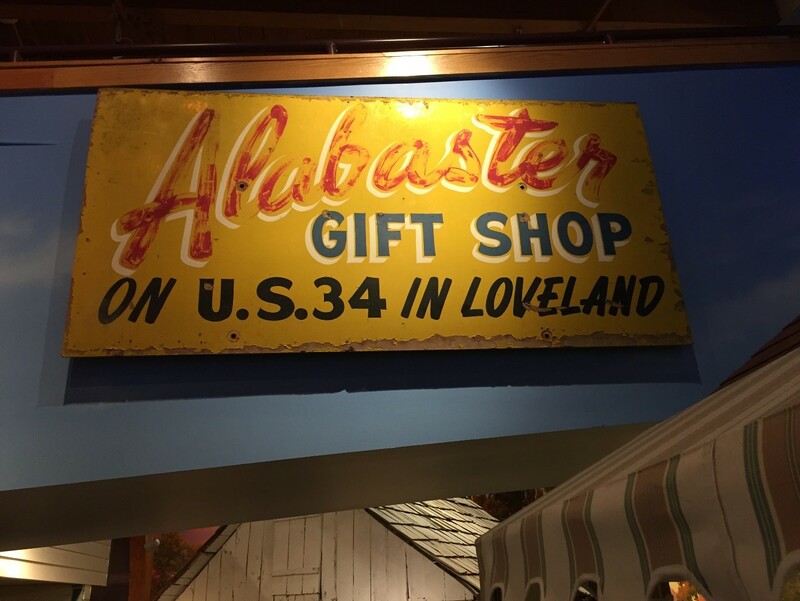 I remember hosing down the sign in the alley before we brought it into the Museum. There were so many vacant bird nests in that sign! Proctor’s Alabaster Shop used to be on Highway 34, attracting tourists heading up the canyon to Estes Park. The shop sold all sorts of carved alabaster wares including stunning lighthouses that lit up, showing off the varying veins of color that run through the stone. Along with the donation of the actual shop came the actual sign! 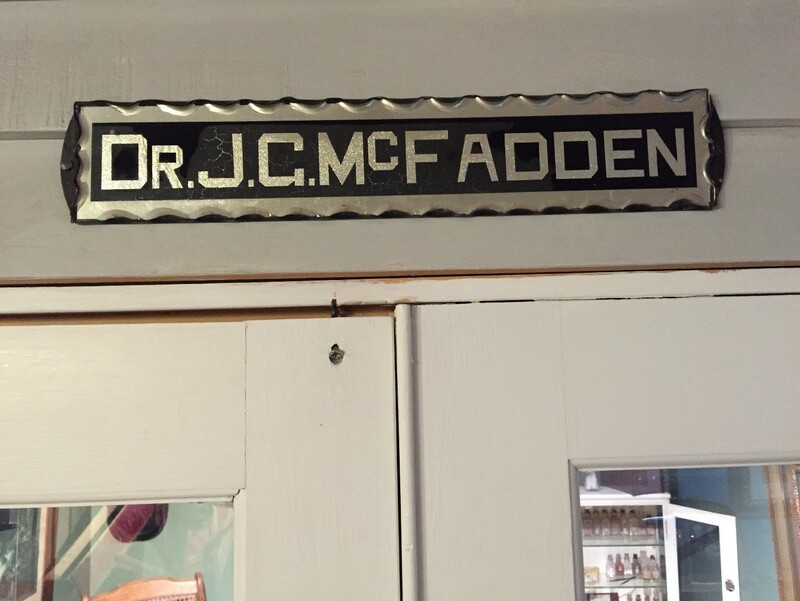 Dr. John G. McFadden was a doctor in Loveland and moved his office to a downtown location in 1895. 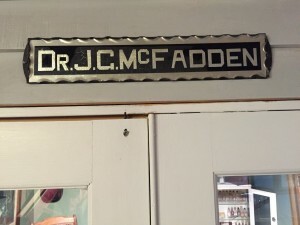 This sign has been hanging over the Doctor’s Office exhibit at the Museum for many years prompting many a school-aged child to ask if the skeleton, also located in the exhibit, happens to be Dr. McFadden. For the record, no, the skeleton is not Dr. McFadden. 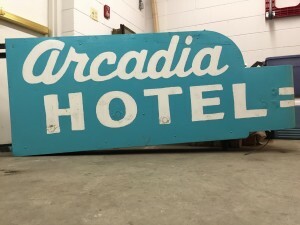 Another sign was donated to the Museum just this past month. It is from the building located at the corner of 5th and Cleveland that is presently undergoing quite a renovation. When first built, the Allen & Bartholf Building housed the W&T Pharmacy on its first floor and an opera house on nearly the entire second floor until 1920s when the opera house closed and the space was changed into furnished apartments under the name Arcadia Hotel. 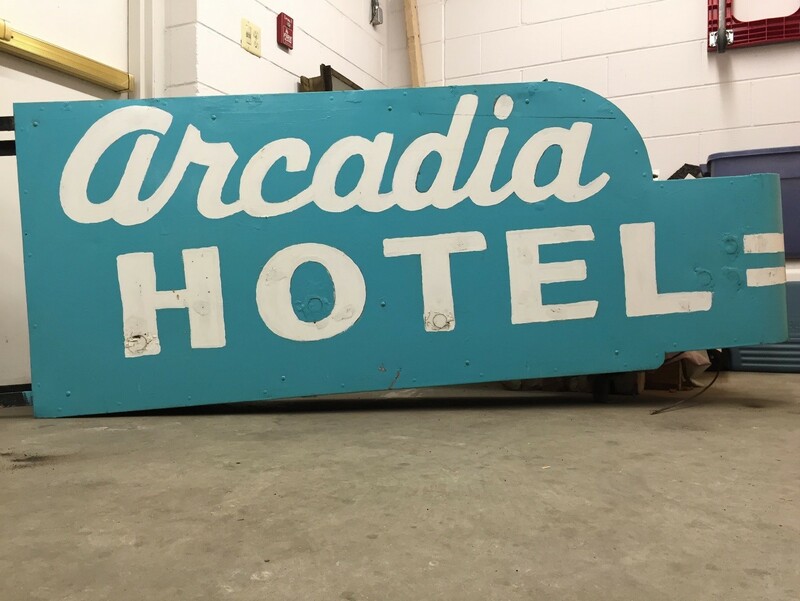 I look forward to placing the sign on exhibit in the Fireside Gallery with a few other salvaged items from the building in the near future. 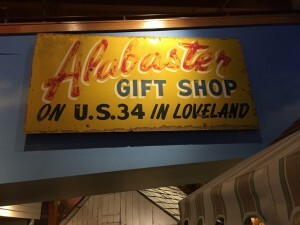 I hope everyone will enjoy seeing this sign, and I hope it sparks some interest in learning more about Loveland’s history!